Physical Therapy Diagnosis: What is Skilled Physical Therapy? What is Skilled Physical Therapy? What can you do better than an athletic trainer, a massage therapist or a kinesiotherapist? 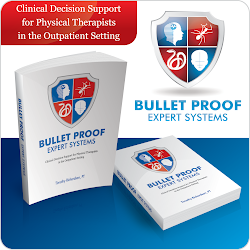 Can you progress your patient to a new level of exercise intensity, frequency or duration? Can you back down the intensity, frequency or duration? Can you assess some new finding or physical sign not in the initial plan of care? Will the patient leave your care better off than when they arrived? Was their outcome more certain? Physical therapists are paid more than athletic trainers, massage therapists or kinesiotherapists precisely because we do bring a greater level of certainty to each patient encounter. Physical therapists produce better outcomes because risky patients don’t get worse with exercise interventions. Physical therapists are paid more than athletic trainers, massage therapists or kinesiotherapists because the physician can expect that patients would otherwise not be safe. An example of a post-surgical total knee replacement will help to illustrate this point. Even an athletic trainer is qualified to show the patient how to do leg lifts for a weak quadriceps muscle. But what if the patient came to therapy with a swollen calf, red, tender skin and radiating pain into the groin? Would the athletic trainer recognize a blood clot? Would the massage therapist use a standardized scale like the Well’s score to quantify the risk, document the findings and call the doctor? Quantify the risk using standardized scales so that terms like better, risky and more are not just superlative adverbs but can be used as measurements for goal setting. An impairment goal of therapy would be to reduce a Well’s score from 2/9 to 0/9. A Well’s score of ‘3’ is a high risk for a blood clot. See also the Medicare Benefit Policy Manual Section 220.2.C (page 20) for a definition and examples of skilled therapy.